Yeah, but: I'm not the first to say it. 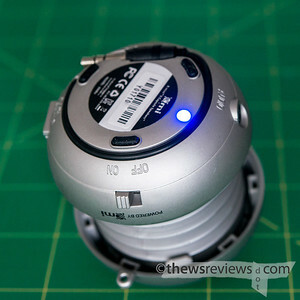 The Long Version: I've been reading reviews of little speakers for a while, and the X-mini capsule speaker kept coming up as one to buy. It can be tough to find in a crowd of others that now share its expanding-ping-pong-ball design, so when I happened to find it in a local store I decided it was time. The speaker has the slogan "sound beyond size" moulded right into the top of it. I'm not a fan of ostentatious displays of marketeering, so this bugs me, but it's a tough slogan to argue with. This one little speaker can play loudly enough that I can hear it throughout my little apartment and worry about disturbing the neighbours. Impressive. What's even more impressive is that the X-mini keeps up a surprisingly good sound quality almost all the way through its volume range, losing only a modest amount of definition when everything's fully cranked. But its entertainment value makes up for that: heavy bass will have the speaker jumping around and skating across tables. It's hard to dislike anything that happy. And if one speaker isn't loud enough then there's the option to add more. These things can be daisy-chained together to hook multiple speakers to a single source. The sound remains mono, but it increases the headroom. There may be a second X-mini in my household's future – officially it would belong to Penny, but we're often in the same place. Also included in the retail package is a carrying case and an unusual cable. It's USB-A on one end, 3.5mm audio on the other, and USB-mini in the middle. 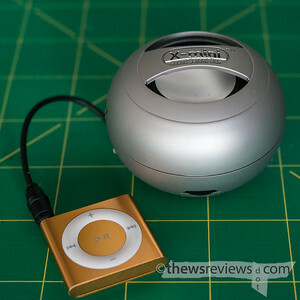 With the mini USB plugged into the speaker, then the audio end can plug into a sound source for a longer connection than what its short built-in cable provides, or the USB-A end can be plugged into a computer or charger to recharge its internal battery. But audio won't play through a USB-USB connection: there's a handy little instruction sheet that says so, but I still fell for it a couple of times. The underside of the Mini shows its controls and the neatly stowed audio cable. (The volume dial is on the other side, not visible, opposite the power switch.) They missed an opportunity here – having the bright blue 'power' LED line up with something useful, like the On/Off switch or volume dial, would make the speaker more intuitive to control. But that's about the only criticism that I can come up with, especially considering the sound-to-price ratio that this little thing provides. 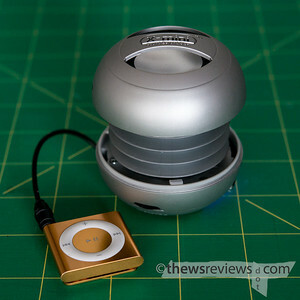 I've been very pleased with the X-Mini as an extremely small and easily portable speaker. It's loud enough to provide some music for a backyard family gathering, and good enough to be an improvement over my laptop speakers. The next time I travel it's guaranteed that this little thing will be coming with me. The Long Version: Of course I wanted to think that it would never happen to me. 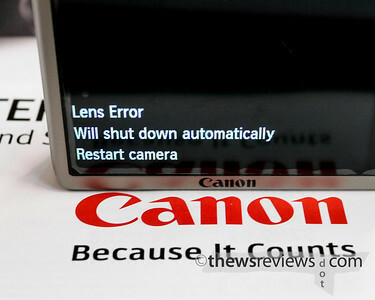 One hundred and seventy-five days after I bought my little S100 compact camera Canon put up a notice that some may "encounter a lens error caused by a disconnected part inside the camera". (Here's the full announcement for both Americans and Canadians.) After 296 days of owning this camera, it was my turn. 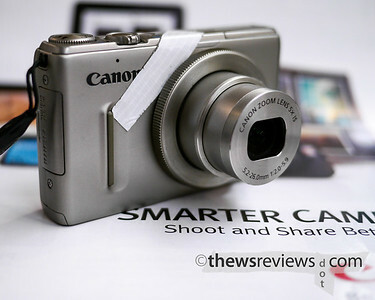 With 4823 photos to its credit, my S100 became the first camera I've ever owned to actually stop working. But at least it didn't fail on a Saturday afternoon, half-way through the trip to New York City that marked my two-year wedding anniversary, leaving me without a decent small camera as the city prepared for hurricane Sandy and using my iPhone to take photos to document my travails as I travelled home by bus, right? But of course that was exactly what happened, and I wasn't overly impressed by the experience. In almost three hundred days of use my S100 has picked up a few battle scars. The silver finish on the flash housing is wearing away from being put in and out of its case – and the occasional pocket – although I don't think I've ever actually used the flash to take a photo. The white duct tape that covers the self-timer lamp is showing its age, but the white reflector tape on the side of the camera, which both increases my night-time safety and smooths over a badly set screw, still looks pretty good. I can only imagine that these adhesives are going to give the Canon Service techs fits. My time with my S100 has taught me two things. 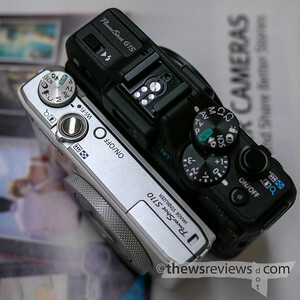 One is that I really do enjoy having a good-quality small camera that can be used with one hand – sorry, Fuji. The other is that the combination of a tiny sensor with a compromised zoom lens means that I won't be printing anything sizeable from its files. Knowing those two things is liberating – it really means that I'm looking for controls and design, not Seriousness Of Purpose. I have enough of that elsewhere in my life. 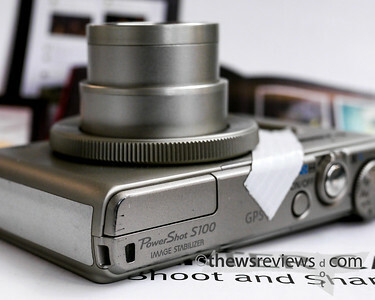 My biggest complaint about the S100 is its f/5.9 aperture at the long end of its lens range. Somewhat perversely, my favourite thing about the camera is how easily it does long exposures without needing me to fuss with its exposure settings. I keep my long exposure setting saved as my program preset – ND filter on, two-second self timer, fifteen second exposure, minus one-third EV, zoom in slightly – although I wish it had additional 'custom' mode dial positions so that I could program in different options as well. 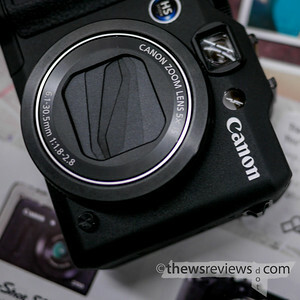 The new Canon S110 improves on none of that. 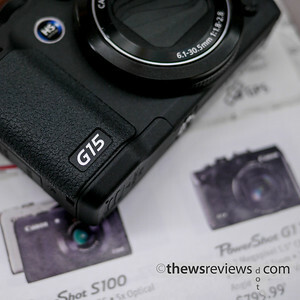 I'll have more to say about the Canon G15 in a few days, but the short version is that it's what I'll be looking at if my S100 needs to be replaced. The service advisory makes it clear that this repair is covered even after the camera is out of warranty, as long as they don't discover some reason why it shouldn't be. And indeed they fixed at no charge – but tell that to the $14.25 that I gave to Canada Post. When I sent my Panasonic GH1 in for warranty service, which was also for a known manufacturing fault, they had the decency to cover shipping. And no, they didn't actually fix the problem, but nobody's perfect. If my enthusiasm for the S100 helped persuade anyone to purchase one, and the first and second digits of the camera’s serial number are any number from "29" through "41", I'm sorry. 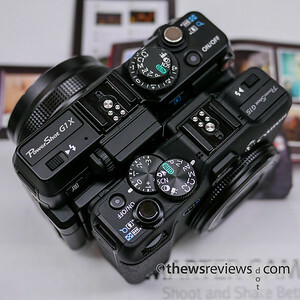 But the good news is that there still aren't really any cameras that are better than the S100 for anything close to the same price or size. Even with its faults, I'm pretty sure I would have ended up with one anyway.